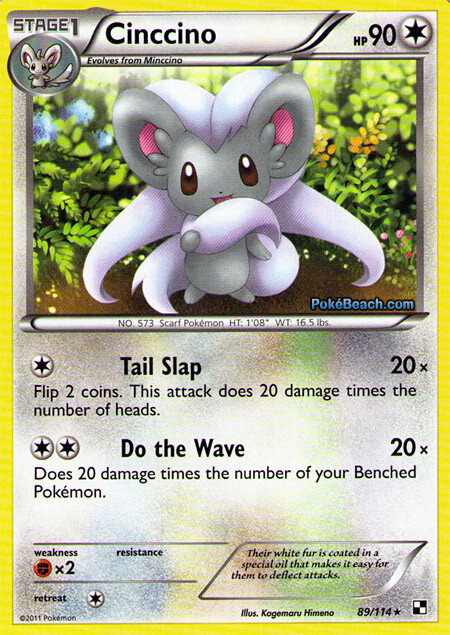 Today’s Card of the Day has been taken from the Black and White Base Set where we find Cinccino as one of our rares. This card did well at Battle Roads when we had the awful MD-BW format, but has kind of died down since then because of various different attributes it has. After building this site, I had realised that I had been spelling it wrong all this time and had to go back to change it all -_-. So apart from being a strange Pokemon to both spell and say, what does Cinccino have to offer? At first glance, we have ourselves a Stage 1 Colourless type with 90HP, two attacks and a fairly good single retreat cost. Now the Fighting weakness that this Pokemon has is going to cause some issues when faced with the likes of Donphan, since it’s going to get OHKO’d fairly easily, however against everything else it is actually pretty solid. Let’s look at these attacks. The first is called ‘Tail Slap’ and does 20 damage times the number of heads you get out of two coin flips. This attack isn’t too bad considering that it only costs a single Colourless energy, but the fact that it could possibly do zero damage really puts the competitive player off from using this attack. The only place I can see this being used is in a matter of desperation for a KO when you don’t have the required energy for its second attack. Not an amazingly bad attack, but Cinccino is all about the second one. ‘Do the Wave’ costs a single Double Colourless and also does 20 damage times the condition below. The small print tells us that this attack will do 20 damage times the amount of Pokemon on your own bench, meaning that it can max out at 100 without the aid of PlusPower/BlackBelt etc. This immediately reminds me of both Jumpluff HS and old-skool Wigglytuff from Base Set since they are both very similar to this one. Jumpluff takes into account both players sides of the field which means your opponent can have a say in how much damage you’re going to do whereas Wigglytuff just has a lot of energy to do half the damage. Cinccino has the best of both worlds really. It is able to take account only its own bench so your opponent can’t manipulate your damage output and it also has the boosted power over the original Do the Wave attack. Even though you are going to be capped at 100 rather than 120 where ‘Mass Attack’ is concerned, this attack can be set up as soon as turn two, much more efficiently. The latest Battle Roads results have shown at least two different variants of Cinccino winning which shows how much of a contender this little guy can be. 100 damage on turn two slots this nicely into any aggressive build of Stage 1s, making for quite the attacker when you’ve filled up your bench. Through the use of things like Pokemon Catcher, you are going to be able to KO even the bigger Stage 1s such as Pignite with Do the Wave, something that Donphan could only wish to do. So overall, this Pokemon has a lot of promise in the current format. It’s fast and has high damage output in comparison, but that Fighting weakness means that any Donphan will give you a hard time. That weakness paired with needing Double Colourless to stay fast could hinder your set up in those unlucky games, but otherwise, this little chinchilla is fast. I’m going to give it a very nice 7.5/10. If you’re looking for a fun variant of Stage 1s to try out then give this a spin. Artwork: Cinccino can hit you hard, but look cute at the same time. This picture has been designed to make Cinccino look as cute and innocent as possible while its pounding the opponent with 100 damage each turn. The flowery garden in the background paired with its apparent shy pose gives you that sense of innocence which the artist has captured very well. I’m going to give it a very nice 8/10. One of the more interesting of artworks and really shows how such an innocent Pokemon can be serious when it comes to dealing damage. Thanks for reading today’s COTD and please rate the card below by how you feel it will fit into competitive play with the star rating system below. « Warning About Possible Wierdness..